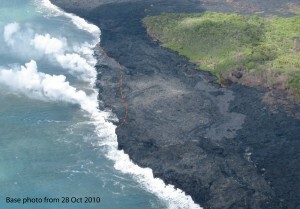 Photo of the Puhi-o-Kalaikini lava delta taken on Thursday, October 28, 2010, prior to the collapse. The Puhi-o-Kalaikini lava delta in Kalapana abruptly shed its western edge last week – no injuries or deaths this time. The Puhi-o-Kalaikini lava delta, which will be four months old later this month, currently stretches along the coast for about 1 km (0.6 miles) and protrudes about 150 m (490 ft) or so out from the pre-eruption coastline. Its surface area is about 9.3 hectares (23 acres). At around 5:30 a.m. on the morning of November 2, a sliver of the western seaward edge delta, about 350 m (1150 ft) long and up to 40 m (130 ft) wide, collapsed abruptly into the ocean. The delta had been sporting two distinct entry points along this edge before the collapse. Afterward, there was but one. The night before, and for most of the nights and mornings in the last few months, groups of visitors have been trespassing on State of Hawaii land to see the wonders of an active ocean entry. Some, if not most, get right up to the edge of the delta to get the best view. Their perch was the same edge that slid into the ocean on November 2. At least one unsuspecting person was out on the delta less than an hour after the early morning collapse. Scientists at the Hawaiian Volcano Observatory repeatedly warn that an active lava delta, one where lava is entering the ocean (like Puhi-o-Kalaikini), is the most hazardous area on the coastal plain. This high hazard rating was earned by the delta’s predisposition to collapse into the ocean without warning. It may seem like an obvious statement but it bears saying again – the only 100% effective way to prevent injury or death by delta collapse is to keep all people off an active delta 100% of the time. Disregard of such vigilance has already resulted in injury and a few deaths. An analogous hazard situation would be a busy road. We all know that it can be dangerous, and potentially fatal, to cross a busy road. Many of us do so anyway secure in the belief that we can avoid oncoming cars. Walking out onto an active lava delta, however, is like crossing a busy road when you cannot see or hear the cars coming. Deaths have resulted from being on an active lava delta. A recent Volcano Watch article reminded us of the grizzly details where curiosity ended in death for four people who ventured out onto an active Kilauea lava delta at the wrong time. There is no known way of judging the right time. The ongoing Kilauea eruption has produced more than 100 individual lava deltas each ranging in size from a few square meters to about one hundred thousand square meters (10 hectares or 25 acres). Each of the larger deltas has collapsed several times. The combined contribution of all these deltas during the entire eruption so far, minus the eroding action of waves, is an increase in the area of Hawai`i Island by more than 190 hectares (470 acres). For the current delta, the narrow embayment created by the November 2 collapse has already begun to fill in. This will only add to the potential for collapse that exists already as long as lava continues to enter the ocean. Lava continues to enter the lava tube system and is carried downslope to the Puhi-o-Kalaikini lava delta, near Kalapana, where it enters the ocean and creates a steam plume. The west edge of the delta collapsed into the ocean early on the morning of November 2. A breakout that began two weeks ago on the lower pali has remained active, sending flows west of the tube onto the coastal plain. At Kilauea’s summit, the circulating lava lake deep in the collapse pit within the floor of Halema`uma`u Crater has been visible via Webcam throughout the past week. The circulation pattern was interrupted sporadically by abrupt increases in the height of the lava surface. These periods of high lava level have been short-lived, lasting up to several hours, and each ended with a sudden drop of the lava surface back to its previous level. Volcanic gas emissions remain elevated, resulting in high concentrations of sulfur dioxide downwind. Two earthquakes beneath Hawai`i Island were felt during the past week. A magnitude-2.5 earthquake occurred at 1:47 p.m. HST on Thursday, November 4, 2010, and was located 7 km (4 miles) southeast of Hawi at a depth of 30 km (19 miles). A magnitude-2.2 earthquake occurred at 8:18 p.m. HST on Tuesday, November 9, and was located 6 km (4 miles) east of Honaunau at a depth of 14 km (9 miles).